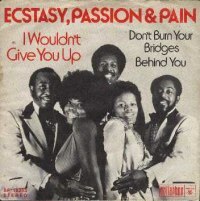 The 70's produced some excellent groups and up there with the best of them was the relatively short-lived Roulette Records act Ecstasy, Passion & Pain. Althought they only released one album and a handful of singles for the label, their impact was to be felt well into future decades. Formed in 1973, in New York, it's seemingly fluid membership of between 5 and 8 persons was entirely dominated by Barbara (Gaskins) Roy. We'll come back to Ms. B. later, let's explore her colleagues first, all of whom were instrumentalists (as was Barbara with her jammin' big guitar) which allowed the group to perform as a self-contained unit. The other members included Althea "Cookie" Smith, rare for an unusual young lady in that she was the group's drummer, while the remainder of the percussion work on their recordings came from Carl Jordan, later replaced by Alan Tizer. Joseph Williams Junior provided musical support on bass and Jimmy Clark was co-guitarist (with Ms. B.) for their entire Roulette recordings. Then there was keyboardist Ronald Foster... Billy Gardner took over keyboard duties later from Foster. It should be noted that any contributions by the group members, other than Roy, to the actual recordings were nullified by the presence of Philly star muscians "M.F.S.B." who were given credit on the original releases. Barbara, as well as commanding her jammin' big guitar, was the group's lead vocalist, nominally supported on backgrounds by other group members but more 'properly' supported by those "Sweethearts Of Sigma Sound"- Barbara Ingram, Evette Benton and Carla Benson. She was also responsible for writing much of the group's material. Barbara, born in Kingston, North Carolina, began her career as one half of the duo Barbara & Brenda, Brenda (Gaskins) being her niece. Together they recorded three singles for the Heidi label, "Hurting Inside," "Special Kind Of Love" and "One More Chance" before coming under the guidance of Luther Dixon and moving to Musicor's subsidiary, Dynamo. Another trio of singles were released by Dynamo, "If I'm Hurt You'll Feel The Pain," "Never Love A Robin" and "Don't Wait Up For Me Mama." A further recording, "That's Enough" remained unreleased until it's appearance on a 1997 compilation "Kent's Magic Touch." With their lack of success Brenda decided to quit the business. Made of stronger stock, Barbara hung in there from her New York base and began playing guitar for Inez and Charlie Foxx ("Mockingbird") and on various recording sessions in New York waiting for another break. 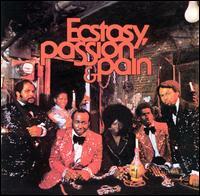 In 1973, Ecstasy, Passion & Pain was formed and shortly afterwards, through manager Phil Braxton, the group had a recording contract. Getting a deal with Roulette Records, Ecstasy, Passion & Pain recorded roughly 28 sides that included demos and finished masters. 10 cuts made it to their one and only album, several were single-only releases and 13 had to wait 25 years to be released! A stream of hits started with their first release "I Wouldn't Give You Up" from late 1973 which hit #-17 on the R&B charts. Next came "Good Things Don't Last Forever" #-14 R&B, #-93 pop. The follow-up "Ask Me," regarded as a classic, hit #-19 R&B and went to #-52 on the pop charts. A side note; the song was such an underground classic that Nigerian-born Canadian disco legend Carol (Uchenna Ikejiani) Jiani cut a version in 1982 that swept the club scene and landed her a worldwide hit. "One Beautiful Day" followed hitting #-14 R&B and #-48 pop. 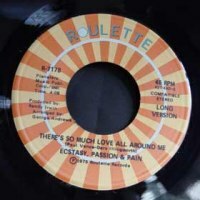 The next release 1975's "There's So Much Love All Around" was first an A-side single and then the b-side to two later releases proving Roulette's faith in the song and the group. Thanks to legendary mixologist Tom Moulton's handy work on "Touch & Go" it became their signature tune as well as an enduring classic. The highly sought-after 12" single is their only Roulette release to be cut on a 12" single. Two more releases in 1977 "Passion" and "Dance The Night Away" failed to match the success on "Touch & Go". By the end of 1977 just as disco was entering it's golden age E.P. & P. disbanded. 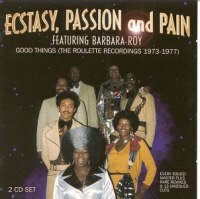 During the years 1977 to 1981 Barbara continued with session work and formed her own successful label, Roy B. Records. As a label owner she had a string of hits with Pizzazz's "I Heard It Through The Grapevine," Soccer's "Dancin' Game," Melody Stewart's "Get Down, Get Down / Action Satisfaction" and culminating with a reunion of E.P. & P. for the 1981 club smash "If You Want Me". Another chart/recording hiatus ensued from 1981 to 1986. Her label had folded and E.P. & P. never really managed to stay together after the brief reunion. By 1986 Barbara had surfaced on RCA Records with the release of "Gotta See You Tonight" followed by another 12" single "Gonna Put Up A Fight" in 1987. However their was no album forthcoming. As of 1989 she was still signed to RCA when she recorded her part for the studio group, Togetherness, assembled to support Paul Simpson on the song "We Are The Ones" from his Simp-House / Cooltempo album, "One". The Togetherness group consisted of Barbara "Ecstasy, Passion & Pain" Roy, Will Downing, Rochelle Fleming, Loleatta Holloway, Toney Lee, Ray Simpson, and Fonda Rae. An incredible line-up to say the least! Sadly Barbara's career seems to be on-hold after this point. Thanks to sampling she can be heard on the 1990's hits: "Son Of A Gun" by JX and "Just Wanna Touch Me" by Fidelfatti, and by virtue of re-release the entire E.P. & P. catalogue can be heard on the U.K. Westside c.d. "Good Things (The Roulette Recordings 1973-1977)"